This month, I had the pleasure of touring the surge barrier with the Deep South Center for Environmental Justice and Lake Pontchartrain Basin Foundation. 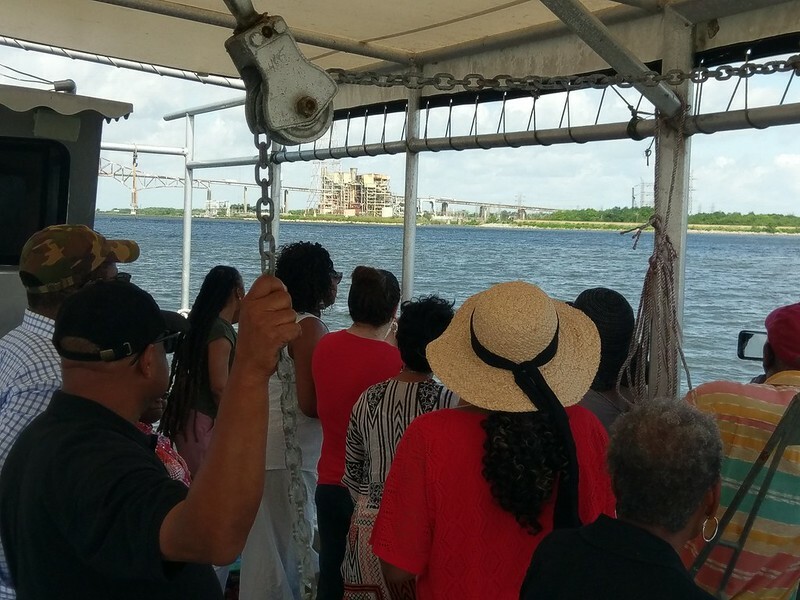 DSCEJ's Water Equity Group came from all five Gulf States to tour Bayou Bienvenue and discuss surge protection -- natural and unnatural. We toured the MR GO ship channel and discussed its potential to funnel storm surge into the City of New Orleans. We talked about the efforts since the federal flood of Katrina to push the Army Corps to fix its mistakes. We talked about the saltwater closure of this Port and the ecological restoration blossoming all the way north to Manchac. We talked about the great Barrier which cost $2 Billion to build and more to operate. We discussed how it wasn't enough. This impressive structure was only built as high as the 1 in 100-year storm surge. This is a much smaller amount of water than what Katrina actually brought to the shores of New Orleans. The lower 9th ward and New Orleans East are African American and Vietnamese American neighborhoods, and they're also the areas most vulnerable to storm surge flooding. These are also areas slated for Industrial Development in hundreds of acres wetland forest and marsh, by Entergy and the Port of New Orleans. 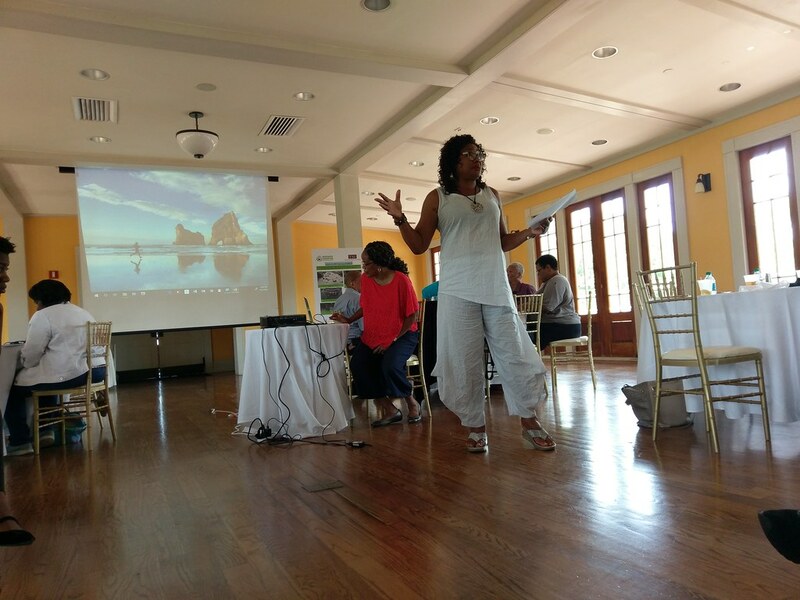 Despite the increased risk from developing wetlands and in wetlands, these public bodies are again seeking to endanger their own facilities but also the people in New Orleans. Even though New Orleans East is a middle-class neighborhood, their class does not protect them from racism. That racism is leading these public entities to develop polluting industries in wetlands vulnerable to storm surge. Entergy New Orleans wants to turn on its huge pumps, which are party to the largest subsidence rates in the entire city. The Port, failing Katrina lessons 101, even cited the Surge barrier as a reason that it could develop MRGO wetlands in African-American and Vietnamese American neighborhoods. They did this, despite the pleas of every planning organization with any jurisdiction, including the staff at the City of New Orleans. We know that this is beyond wrong. At first, the Port of New Orleans denied that it knew these areas were wetlands at all. On the basis of that willful ignorance, they deceived the City Council, and Council changed the land use of these wetlands to industrial. So here we are witness not only to racism but environmental racism. The Port seeks to erase the history of people who might live in the areas that they want to place hazardous facilities. They must erase the hazards and qualities of the natural environment within their property lines in order to advertise their properties as a non-hazardous and fair place for doing business. Placing hundreds of thousands of feet of rock and concrete into these swamps goes against science, abuses good engineering, and is an affront to good sense. It goes against moral decency and fairness to New Orleanians of color. Here we see that the struggle for equity and the struggle for the environment are directly connected. In New Orleans, if you want to save the wetlands, you have to fight racism. You must fight anti-black, and anti-Vietnamese attitudes that would allow harmful developments on top of us. So if you care about climate, if you care about the wetlands, if you want to protect the water, join your brothers and sisters who are already fighting to protect themselves. Let's protect everyone from the climate changes to come. Please sign our letter to the New Orleans City Council advocating for wetland protections within Orleans Parish. It's the natural thing to do, and it's the right thing to do.